The most famous tattooed man of this period was Horace Ridler. In 1927 he asked London's leading tattoo arti st, George Burchett, to tattoo him all over, including his face, with inch-wide zebra stripes. When the tattooing was complete Ridler enhanced his appearance by having his teeth filed down to sharp points. He had his nose pierced so he could insert an ivory tusk in it and had his ear lobes pierced and stretched until the holes were more than an inch in diameter. 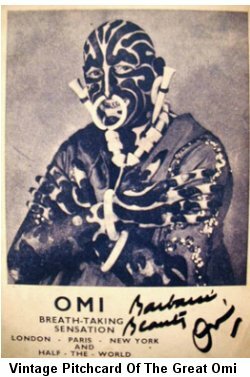 At the end of this ordeal, Horace Ridler had been transformed into The Great Omi, one of the most successful freaks in the history of the circus. He enjoyed a successful career until his retirement in 1950. He and his wife then moved to a small village in Sussex, where The Great Omi died in 1969 at the age of 77. The Great Omi succeeded because he was unique. But during the latter part of his career fewer and fewer tattooed people were seen in circuses. They were no longer novelties. Circus patrons were losing interest in seeing yet another man or woman covered with traditional American-style tattooing. Another factor was the demise of the freak show, in which tattooed people were usually exhibited. After World War II freak shows came under attack from medical authorities and social reformers who objected to the practice of exhibiting deformed individuals as a source of amusement and profit. At the same time, medical advances made it possible to treat or prevent many of the hormonal imbalances and other conditions that had caused the physical deformities seen in freak shows and as a result, fewer people were available and willing to exhibit themselves as freaks. And the attitude of the public had changed. Circus patrons were better educated and more sophisticated. They no longer believed the ballyhoo and the preposterous stories that were the staple fare of the old-fashioned freak show. The individuals who were exhibited as freaks were considered sick and unfortunate, and parents no longer took their children to laugh at them.